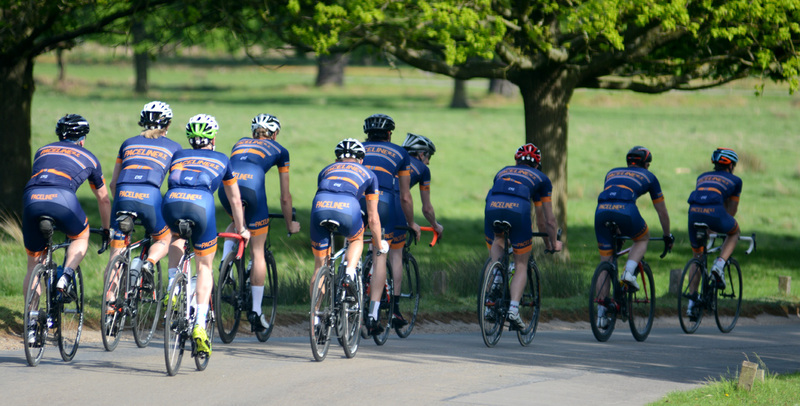 You’ll spot us around the roads and lanes of Surrey and Kent, a blur of navy and orange and a cheery wave of hello. Our regular rides are the Sunday club run, and during the off season our evening winter training rides. But the club has riders going out most days of the week, all of which are organised via the club forum. If you’re looking for some company on a spin simply post on the forum and someone’s bound to join you! Club runs go out on most Sundays, meeting at 9am at Hampton Court station. Details and routes posted up on the forum 0r our WhatsApp groups in advance. We don’t stick to any set routes – every ride is a chance to explore unridden roads, discover new climbs, and to continue the eternal quest to find the perfect coffee and cake stop. Most routes head into Surrey, but during the winter months heading West is often a safer option. Equally start times are flexible, some may want to get an earlier start, others may choose longer in bed when the mornings are cold and dark. Anyone is welcome to join us for a ride, however we do ask that you email us first to let us know you’re coming. Around October until March, our riders head out on the local winter training loop, which is approximately an hour of hard riding. Meeting in Kingston, the route heads towards Chertsey, on to Brooklands looping through Cobham and back via the Esher Rollers. There’s an added emphasis on safety on these night time rides, with all rules of the road strictly obeyed. These are training rides and not races! Our riders are expected to ride safely at all times and in a predictable manner. In groups, this includes communicating as a unit the oncoming hazards, and also ensuring that the group stays together. You’re not only responsible for your own safety, but the safety of your fellow club mates. Don’t take unnecessary risks – remember that you’re riding as a unit. Remain two abreast when safe to do so, and single out when on busier roads. Negotiate bends and junctions as a group rather than individually. Anything that needs you to break from a continuous safe, predictable line needs communicating to those behind you. Simple hand signals are better than random shouts. Also be aware of who is behind you. As riders positions change in a group through the course of a ride, it is good to know who is behind you as this will allow you to communicate with those on the front that there are riders off of the back. You’re not expected to have the latest carbon fibre frame with fancy racing wheels – but you should have a bike that’s in working order. That means tyres that are in good condition and are suitable for the terrain and time of year. Please carry with you at least one spare inner tube and the means to fit and inflate it. A multi-tool is also recommended. Lights are a good idea in winter (and obviously when riding at night! ), as are bright or reflective clothing. Be prepared for changeable weather with extra layers – finding yourself frozen to the core during a heavy downpour out in the midst of the Surrey Hills is not an experience you’ll want to experience too often!